If you want to get One Grip Higher consider taking the Rotten Banana Test! As I write this post in Rochester New York, we are in the midst of a heat wave. The temperatures are cresting in the high 90’s and the forecast for tomorrow is suggesting that we could top 100 degrees for the first time since the 1930’s. For us northerners, this is crazy hot! Part way through the day I realized I had left my lunch in the car. When I went to retrieve it I realize that the heat had dramatically altered my lunch. The car had acted like a microwave and roasted my food. I cracked it open with a sense of trepidation and the first thing I saw was my banana. It was fresh when I packed it, and now it was solid black and totally squishy. Not cool. The next thing I found was my sandwich. The cheese was completely melted and the bun was warm and soft. With my stomach growling and needing something to eat I apprehensively unwrapped my sandwich and took a bite. The banana was clearly not an option! Incredibly the sandwich tasted pretty good. It was almost like a panini (without the crispy crust). In spite of the heat, my lunch was actually pretty good, banana excepted of course. In spite of my miserable expectations, my “panini” was a bright spot in my day. How do you respond to when the pressure really builds at work. When the heat is getting turned up in your life, how do you act? What is like for others those depend on you, when you begin to feel the heat of expectation and commitment? Do you turn nasty like a rotten banana? Or do you resemble the palatable “panini”? The fact of the matter is that in life, if we are trying to make a change and have an influence, the heat will get turned up on us from time to time. Pressure will build and demands will increase. We all have an option in how we respond. These times will not be our best times… but they shouldn’t be unbearable for those around us. 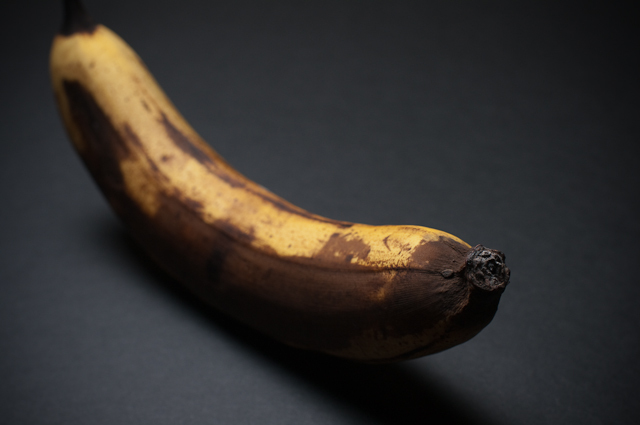 If you want to get One Grip Higher, take the Rotten Banana Test… when the pressure is on, are you nasty to be around? Or are you a pleasant relief that helps and supports those around you?